Interesting. I can't quite figure out what the metal ring and black stuff is under the lens. Am I missing something? Very nice image. 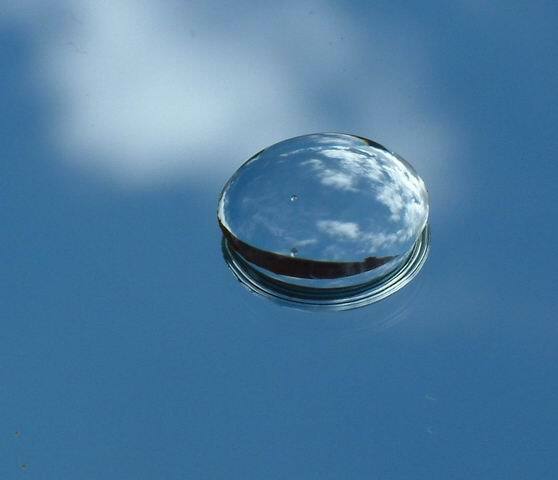 The only thing is that I couldn't tell it was a contact lens till I saw the title... it looks more like a water drop. I love the idea though, especially the sharp/OOF distinction. Nice image. I especially like the reflection of the clouds in the lens(?) or droplet of cleaner(?). Colors are good. Depth of field is terrific. Focus is fine. I am slightly bothered by the 2 little droplets ... but I'll get over it. Good job. Among my top 5 picks. Nice, doesn't really look like a contact lens here, but a nice image. This picture does not inspire me in terms of advertising. However, the way you shot the photo is elusive to me... is this a reflection of the sky on a car hood, perhaps? While I wouldn't pick this to win the advertisement challenge, I am impressed by the creativity of the photo, so I would give you a 7. An excellent image, while not as punchy as I like an 8 nevertheless. Proudly hosted by Sargasso Networks. Current Server Time: 04/18/2019 10:36:07 PM EDT.